About 70 percent of pharmaceuticals are manufactured using palladium-driven catalytic processes that are either fast or efficient - but not both. Researchers at North Carolina State University have now developed a green chemistry method that combines aspects of both processes to improve efficiency at a minimal cost of processing time. Specifically, these palladium-driven catalytic reactions are used to connect carbons in small, organic molecules to create larger molecules for use in pharmaceuticals and other applications. Traditionally, there have been two ways to do this. In homogeneous processes, palladium is dissolved in solution, allowing maximum exposure to the organic molecules, or reagents. This makes the process very fast, but results in a lot of palladium either being wasted (because it gets thrown out after target molecules are harvested) or being recovered at high cost (because the recovery process is expensive). In heterogeneous processes, palladium is fixed to a hard substrate in a pack-bed reactor, and the reagents are run through the reactor. This takes much longer, but little or no palladium is wasted. "We've created and tested a new process called pseudo-homogeneous catalysis, which combines the best of both worlds: it is nearly as fast as homogeneous catalysis, while it preserves virtually all of the palladium," says Milad Abolhasani, an assistant professor of chemical engineering at NC State and corresponding author of a paper on the work. The new technique relies on novel, elastic silicone-chemistry based microspheres developed by the research team using microfluidics. 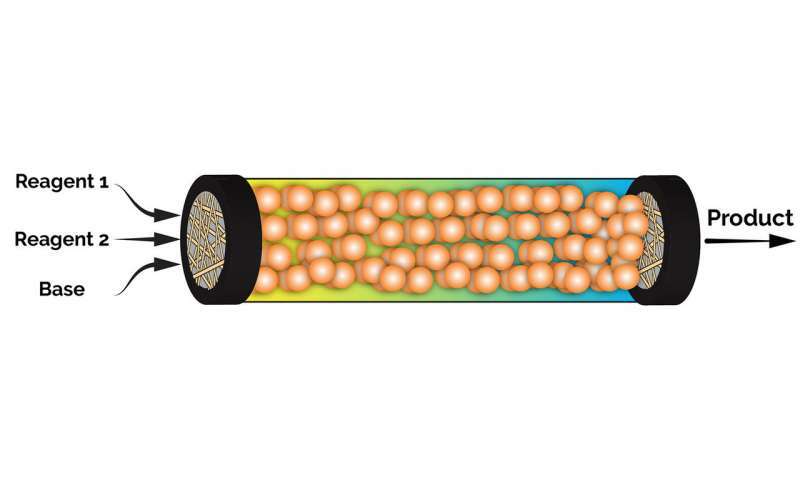 "We used a microfluidic strategy to make elastomeric microspheres with a narrow size distribution to make them 'loadable' into a tubular reactor without clogging," Abolhasani says. "That was essential, because conventional batch scale polymerization techniques result in elastomeric microspheres with a large size distribution that would clog the reactor when loaded." Video of the process for creating the microspheres is available at https://youtu.be/YwkFvMhtIdk. Each silicone microsphere is loaded with palladium. Reagents then pass through the microsphere and interact with the palladium. The resulting pharmaceutical target molecules leave the microsphere again - but the palladium remains trapped in the microsphere. "The flexible spheres allow the palladium catalyst to 'settle' inside the microreactor environment," says Jan Genzer, the S. Frank and Doris Culberson Distinguished Professor of Chemical and Biomolecular Engineering at NC State, and a co-author of the paper. "The flexibility of the silicone sphere allows the palladium catalyst to adopt very many configurations during the reaction - as is the case in homogeneous processes. 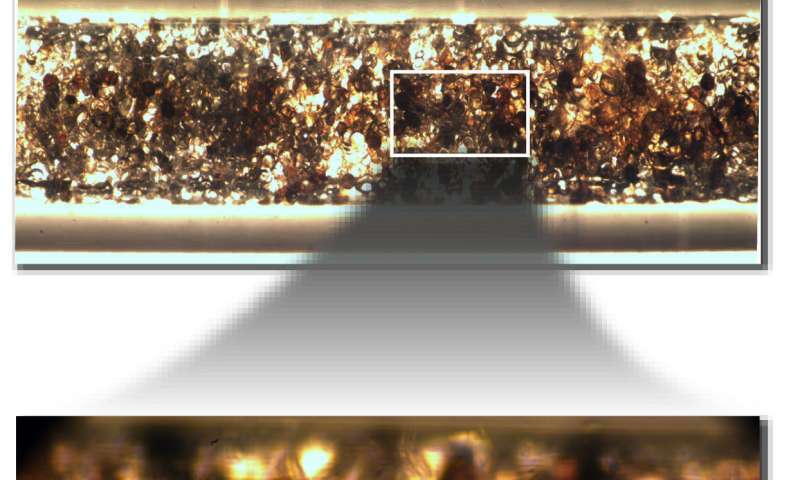 The palladium catalyst is retained for further use - as is the case in heterogeneous processes." "In proof-of-concept testing, our process was much faster than any heterogeneous techniques, but still marginally slower than conventional homogeneous processes," Abolhasani says. "We're currently working on optimizing the properties of our elastic microspheres to improve the reaction yield." One other advantage of the pseudo-homogeneous technique is that it makes use of nontoxic solvents, i.e., water and ethanol. Conventional homogeneous techniques use typically organic solvents, such as toluene, which are not environmentally benign. "It is important to demonstrate that green chemistry approaches can be used to make a process that is, in all, more efficient than existing techniques," Abolhasani says. "You do not have to trade safety for cost-effectiveness."